Imgur Album >> Click Me! 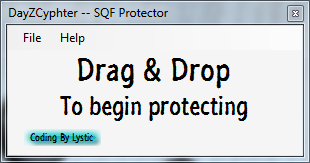 The Protector Changed all of the code within a selected SQF / TXT File to that of Arma 2's toString Method. With this protector it makes it harder for a skid to view and edit the code. Although SQF protection is easily reversible, it is still nice to have and use to make a script just a bit harder to decode. The DeProtector is a decoder for the protector. It works on almost any toString methods. There is an option that allows you to do a multilevel decode (This can result in errors as proper code checking has not been implemented) and also allows for single level decodes. Single level decodes are to be used if you are unsure about the origins of the code. 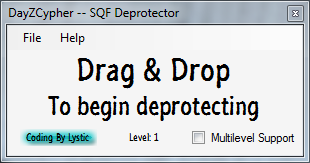 The DeProtector is useful for "decompiling" RE's and other sqf files. The Junkifier was added because I got bored. It functions as a way to hide your true code from skids. Only Use this ONCE PER SQF File. Will update with attachment once it starts working! You can generate this code addition dynamically and detect if it is already in place and even strip it when decoding. Error checking - just use a regex for the tostr and it should be simple enough, no? Also you will want to "minify" the startout sqf because the size is n +10 chars to the t (number of times you've encrypted) which scales to MASSIVE files. Let me know if you want some help coding this stuff! No, you don't want to do that. It's less efficient, because what you're doing is keeping a toString level to be run EVERY TIME the script is used. My method only decrypts it once. That does only run it once. Does the code have to have proper parsing? I know that when I used to toArray things, I would have to toArray a string of code. would be the proper way to contain a string inside of a string, if you have a long, complex script, it is not very easy to convert the whole thing into a string where the apostrophes and quotations don't conflict with each other. Does this program automatically parse the whole script and make it a string? Last edited by Rustler; 04-11-2013 at 03:03 AM.
" This is code "this is the string inside the code "The rest of the code"
Last edited by Lystic; 04-11-2013 at 04:19 PM. Oh alright, I guess it just kinda skips over... When I used to do it I had to turn the whole thing into a string in order to send it ToArray. 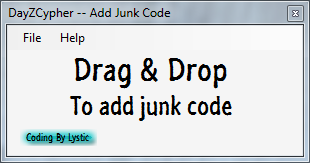 Nice program, works smoothly. Actually that would NOT decompile only once. This works ONCE if you are doing a SINGLE level encryption. If you're encrypting twice, this will NOT work. The way the encryption works is it will execute the entire multilevel encryption the first time. not requiring it to be run multiple times.